April 2008 was a funny old month - lulling us into a false sense of security with some nice sunshine and then deciding we ought to get a bit of snow instead. 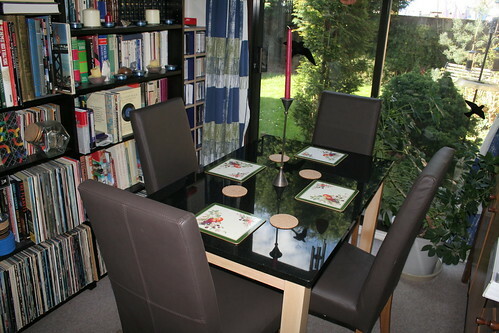 I mused on various aspects of training and design, and got to sit down at a proper dining table again for my meals. 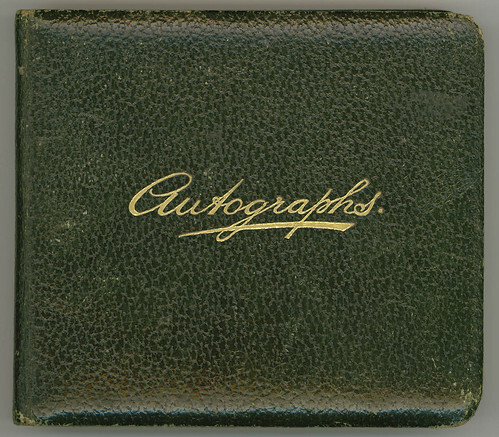 This evening I've been scanning an old autograph book that was given to me by one of my relatives when I was a kid. If you click on the image you'll link through to the first of a whole set of scans stored over on Flickr. It's so long ago since I was given the book that I can't remember where it came from. It contains a lot of drawings by someone who signs himself "T.B.B" and my father thinks that this was probably Thomas Baxendale, who knew dad's parents many years ago. On the other hand, mum thinks the "B" might stand for Barcroft, which was my grandfather's name on mum's side of the family. All in all, it's a bit of a mystery. The images are quite funky; most of them are what would have been recognised as newspaper-style cartoons complete with the requisite laboured captions and lapses of political correctness but there are one or two attempts at life sketching that are pretty good in my opinion. As an illustrator I have always found the sketches fascinating, which is probably why I ended up being given the book in the first place. The whole set consists of some 27 pictures, the last drawn in 1922. Have a look! Twitter's public timeline page has become a bit of a fascination for me over the last few days. It's like putting your mouth to a firehose of scattershot communications across the Internet. Click refresh and you can get anything from the latest news and sport or the current position of the International Space Station to paranoid musings on the state of the Middle East and many, many people pimping their websites, books, Flickrstreams or other endeavours. Click refresh, and you get another set of up-to-the minute observations, diatribes, gentle nudges and rants. It's addictive. There are people out there who treat Twitter almost as a form of performance art; some entries are hauntingly poetic, no mean feat when you're limited to 140 characters. On the other hand, some people seem to be treating Twitter as a way to massively increase their social network; I have a couple of followers who have signed up to receive tweets from literally thousands of people - I've pretty much maxed out following a dozen. Their inboxes must be like drinking from that firehose twenty four hours a day, seven days a week. I defy anyone to get anything even remotely useful from that level of input beyond a simple and trivial sense of the day's zeitgeist. There is no way to sort out the signal from the noise. Still it's fun to do every now and again. ...to Rebecca, who completed her 10 kilometer charity run this morning. I don't think I could have managed that sort of distance! Yesterday I realised that it was thirteen years ago this week since I put an offer in on this house. I've never lived anywhere for more than nine years before, so as I cut the lawn and weeded the path yesterday I was thinking about what's happened since I moved here. It's been an interesting trip; when I arrived here it was to make a fresh start after making it through what was probably the lowest point in my life. I was getting divorced, I'd left my job at BT and I was leaving most of the things I'd been comfortable with for the best part of a decade. Of course, I still miss some aspects of the life I used to have - you don't spend eight years of your life somewhere without it making an impression on you - but I don't regret moving away for one second. Moving down here to the West Country did me good. I found a focus for what I wanted to do with my career and ended up in a job that has been both surprising and rewarding in equal measures. I discovered that I actually enjoyed learning and the academic life, and ended up with a Masters degree in the process. While I was doing the gardening yesterday I ended up in a conversation with one of my neighbours, and I love how easily and regularly that sort of thing happens around here. I may still live on my own, but for the first time in my life I feel like I'm part of the community. By that I don't just mean that the landlord of the nearest pub and I know each other by our first names, although that's certainly true as well! I've met people down here who have become good friends. My quality of life is significantly improved; I love living with the countryside on my doorstep. It's funny how things that you think are drastic upheavals at the time turn out to be good for you in the long run. Thanks to Newro for bringing the ultimate geekwear to my attention today: a pair of trousers with a QWERTY keyboard built into the front so you can type while you're sitting down. Because of course, you really need to be able to type no matter where you are sitting. Some designers can come up with simple and elegant designs for corporate logos, graphics that convey what an agency is about with an economy of line and an aesthetically pleasing result. And other designers can't. What were they thinking? Thanks to Heavyboots for this one, which had me giggling for quite a while yesterday. Quite a few people emailed me yesterday because they'd heard about Sky TV's announcement that a new version of Blake's 7 is in the works. As far as I can remember, the original show was touted by the BBC as a television epic worthy of Star Wars (which had been released the previous year). However, what we got was a much lower-budget affair; developed by Terry Nation, the man more commonly remembered for creating the Daleks, it featured a dysfunctional set of fugitives battling a dysfunctional galactic federation in a series of dysfunctional quarries, gasworks, corridors and nuclear power stations. The studio sets wobbled. The props looked like they were about to fall to pieces (and off camera, they frequently did). The spaceships were often suspended by very visible wires. The scripts were so predictable people made up drinking games to render them tolerable. With the exception of Paul Darrow, who played Blake's second-in-command Avon as if the whole enterprise had been put together for his personal amusement, the actors all bore a permanent look of horror as if they couldn't believe they'd signed up to do a whole series. Their expressions grew ever darker as the show was renewed, running for a total of four seasons. It says a lot about the programme that when the final episode was broadcast as a Christmas special it ended with pretty much the entire cast being massacred. From start to finish Blake's 7 was dreary, miserable stuff and back in the 1970s people absolutely loved it. The idea of Sky producing a glossy, well-made and presumably extremely expensive reboot just seems totally wrong. I bet it won't have Josette Simon in it, either. She was the only reason I watched the last couple of seasons. Strangely enough, none of the news articles I've seen mentioned the fact that Blake's 7 was actually remade a few years ago with Johnny Vegas as Blake and even more alarmingly, Mackenzie Crook as Servalan. The 15 minute short film even had Peter Tuddenham reprising his role as the grumpy and pedantic computer Orac. Following the tradition of the original show, it was filmed in a suitably exotic location: Newport Pagnell Service Station on the M1 motorway near Milton Keynes. Nice. One of the less widely reported occurrences yesterday was that Hello Kitty Online (a virtual world based on the Sanrio characters) started closed beta testing. Even the site's front page is so overwhelmingly sweet that I can feel myself slumping into a coma as my blood sugar levels skyrocket. Participating in an immersive online space designed along the same lines must amplify the experience a thousandfold. I don't know about the rest of mankind, but my sensibilities are not capable of withstanding that level of cuteness. Okay, I nearly bought a Hello Kitty Strat once, but I was being ironic and anyway it was going for a knock-down price (now there's a surprise). Virtual worlds are big news at the moment and there are some interesting developments cropping up every day. In my job I'm currently looking at ways in which virtual spaces can be used to support learning and I get the sense that the field is really taking off. This month's issue of Training and Simulation Journal is chock full of articles about organizations using the technology to improve their training programmes and the technology is maturing surprisingly quickly. You've only got to look at how far Second Life has come in the last year to realise that there's a lot of time and effort being devoted to making things work. There's an interesting interview with Uma Thurman over at MTV where she talks briefly about an upcoming Kill Bill anime short which may form part of a new, super-duper DVD release. About bloody time, I say. I held off buying the existing DVDs for over a year in the hope that there'd be a deluxe box set. It was going to be called "Kill Bill: The Whole Bloody Affair" so it wasn't just idle speculation on my part, but of course nothing materialised and Quentin went on to make other movies. Eventually I gave up and bought what was out there. They're okay; in fact in comparison to releases that other films get they're pretty good, but when Quentin Tarantino is iinvolved, you expect something a little special.Perhaps he's finally getting round to it. We can only hope it doesn't take as long as Blade Runner did. It's Earth Day today. Or perhaps it isn't. There are actually two Earth Days, which tends to dilute the environmental message somewhat. The "official" Earth Day site says it was held on March 20th, which was the spring equinox. According to NASA, however, Earth Day is today. To commemorate the fact, NASA TV is broadcasting views of the planet in high definition today. This would be nice if I could pick it up here in the UK, but unfortunately I can't. All in all, Earth Day seems to be a bit of a loss, really. Good to see that the Government is on the case when it comes to looking after its citizens, protecting their personal details and providing the services they need so the UK's populace can go about their business enjoying their hobbies and earning money doing what they do. After all, those same citizens pay their salaries - and their expenses claims - through taxes, don't they? Web designer Daniel Lafreniere has an interesting article on his site about user research. The thrust of the article is that it doesn't happen often enough; people put web sites together without ever once talking to the people who are most likely to be on the receiving end. I'd argue that this sort of behaviour isn't limited to web media. I'm sure you can think of other things you've come across that were obviously put together without any regard for the poor bastards who were expected to use or experience them. Modern day air travel, for one; quite a few television shows I can think of; and any number of things that prompt a response of "yes, but what is it for?" or "how are we supposed to use this?" Even in the training business, I've suffered through courses that had been put together by people who had not only failed to decide exactly what it was that they were supposed to be teaching, but had also obviously never listened to any users who had already completed the training. Forget the traditional "happy sheet" - I find it helps if my students let you know where the training could be improved. I've worked through CBT courses that were full of typos and misprints, and which were so badly designed that the instructor gave up and disappeared before we completed the final section of the course! The more clued-up folks in training use a formal process for what's called Training Needs Analysis, or TNA. In simple terms, it's all about finding out what people do, determining what they should be doing, and then prioritising training that provides the knowledge, skills and attitudes that will bridge any gap between the two that might exist. Simple, right? So why don't companies take this approach to products outside the training industry? The answer is that elsewhere, industry has taken the idea of needs analysis and subjected it to neglect, gamma radiation, spider-bites and red kryptonite until it mutated into the concept of focus groups. I've sat in on focus group sessions, and they bear no relation to the structured interviews employed in a decent TNA session. The average focus group can take a brilliant idea and kill it stone dead in no more than twenty minutes. What tends to happen is that the participants begin to view themselves as the designers, and start doing what they think of as designery things to the concept, a process known by the old hands as "ruining it". Before you know it, the initial goal of the discussion - finding out what the product's users actually do - has been lost, buried under statements that invariably begin with words like "it would be really nice if..." if you're lucky and "wouldn't it be cool if..." if you're not. That's why I prefer to talk with as many people as possible when I'm putting a training course together. Especially with the people at the sharp end. It's amazing what you find out. Sometimes, you don't actually get to the good stuff until quite late on in the design process but when you do, what your design needs to do suddenly becomes simple and straightforward. It's a lovely feeling. Glorious to see the Avro Vulcan bomber XH558 back in the air today. The Vulcan to the Sky trust have done an amazing job restoring it; getting it back to an airworthy state would not have been a trivial task. It wasn't just a case of the aircraft sitting neglected in a hangar for a decade or so - a former colleague of mine was involved in decommissioning the fleet and as he put it, "we made sure they weren't going to fly again." Repairing and making good all the holes, finding missing parts - it must have been a mammoth job and it's good to see the results roaring about in the sky once more. Hell has frozen over; apparently, Guns and Roses have at last decided that they've finished making their latest album, Chinese Democracy. When I read that at the NME's website, I had to check the date to make sure it wasn't April the first. After all, they've been working on the thing for fourteen years. In fact, they've been working on it for so long that it could hardly be described as "new." The lineup has changed extensively, too. Okay, by "extensively" I'm referring to the fact that there's only Axl left from the lineup that was such a monster success in the early nineties. Remember "You could be mine" for instance? Okay, the latest planned release date for the album was three days ago, so they've missed that deadline, but at least things are finally moving in the right direction. On the one hand, you could argue that GN'R have been working on this album for so long that the world no longer has any interest in their output. On the other, you could point out that the current furore over the Olympic torch means that the album's name could lend the band an aura of spooky prescience; perhaps they *meant* to have the album ready just as the international diplomatic situation got interesting. Things could also get interesting for soft drinks manufacturer Dr Pepper, who recently promised to buy everyone in America (except ex-GN'R guitarists Slash and Buckethead) a drink if the album comes out before the end of the year. This week I have mostly been looking at some amazing photos and animated GIFs of the International Space Station taken from down here on the ground. This is getting silly. The New York Mets got rickrolled this week. I'm working at home today while I wait for some furniture to be delivered, although at the moment I feel like going straight back to bed. I've been rather under the weather for a couple of days now. Still, the weather is improving, so perhaps my cold will too. At the moment I'm looking out of the window and there are two robins sitting on the garden fence enjoying the sunshine. There have been more birds than usual in the garden over the last few days, probably because of the bad weather. On Sunday morning and yesterday there was snow on the ground when I got up. It's not just the usual greenfinches and blackbirds, either - on Sunday afternoon there was a goldcrest in the tree by the window. I've never seen one here before. The BBC's children's channel CBeebies asked people who their favourite TV animal was, and the cloth cat Bagpuss came way out in front. Considering he was up against competition like Tom and Jerry and Winnie the Pooh, I think that's rather impressive. I had to nip up the road to the DIY shop before I could assemble it, as it didn't come with any nuts for attaching the legs to the rest of the table. This one should be a little more robust; the top is solid granite and extremely heavy. From one science fiction concept to another: the new series of Doctor Who starts tomorrow. I think it says a lot about my feelings for the show that, whereas last year I was psyched up about it for weeks in advance, this year I only found out about it when Rebecca told me yesterday. I'll watch, but I'm really not expecting very much. Aliens may well be romping through Cardiff regularly over the coming weeks but just off the A5 up in Clwyd, the Welsh Space Agency continue their activities to push back the frontiers of exploration, "blindly going where no-one has bothered to go before." They have a slightly lower budget than the Doctor Who production team, but make up for it in attitude and enthusiasm. Many thanks to Ifor for bringing their excellent website to my attention. Could guitar sharing be the next big musical craze? Andreas Öberg and Mattias "IA" Eklundh play some gypsy jazz in a way that would have left Django Reinhardt completely stunned. Awesome. This evening I uploaded a picture to Flickr which I called Very orange. I then go to my contacts page and find that Ruth has simultaneously uploaded a picture called It Was All Yellow. And her picture was better than mine, too. How'd that happen? The BBC's Matt Frei was struggling when cameras failed at the TED conference recently. Then he started getting heckled. But the heckler turned out to be Robin Williams, who saved the day. He was on fine form, too.